Please pay attention to the bank charges. For any bank charges (including from bank sender and receiver) will be the student candidate’s responsibility. – Please put your full name on the bank receipt. – Payment receipt can be submitted via email (Attached). With BIPA, not only will you learn Bahasa Indonesia, but you will also be involved in very stimulating extracurricular activities such as traditional music and dance, and batik painting. These activities are held in the afternoon. In the traditional music class, you will learn both traditional songs in local dialects as well as popular songs in Bahasa Indonesia. In the dance class, you will learn traditional dances from one region in Indonesia. The activity in which participants show the most interest is batik painting, in which participants not only learn the principles of making this traditional fabric but also experience making batik from the start to finish through hands-on activities. We can guarantee that whatever extracurricular activity you choose, it will be a very rewarding one. If one activity is not enough for you, you can take as many extracurricular activities as you wish to fulfill your interest in Indonesian culture. At the end of the semester, you will demonstrate your ability at BIPA’s graduation ceremony, in which everyone can be a witness to your success. In order to make you familiar with daily life in Indonesian society, we also arrange exciting one-day visits to local areas. You will also have the opportunity to meet other foreign students in other exciting trips organized by UI International Office. TIBA, or the Indonesian Proficiency Test, is a comprehensive test which assesses all aspects of your Indonesian proficiency: Menyimak (Listening), Membaca (Reading), Berbicara (Speaking), Tata Bahasa (Grammar) and Menulis (Writing). 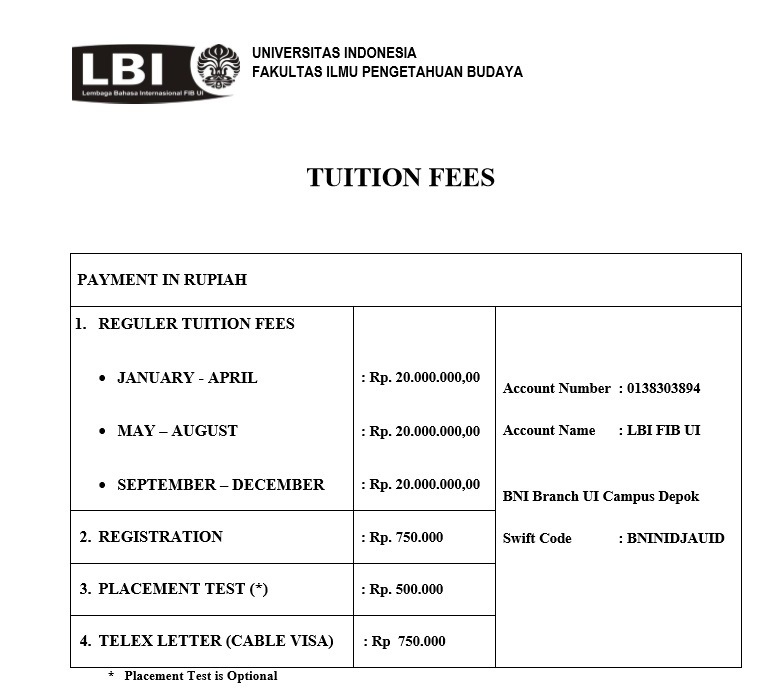 The result serves as a requirement for international students interested in studying at universities in Indonesia. 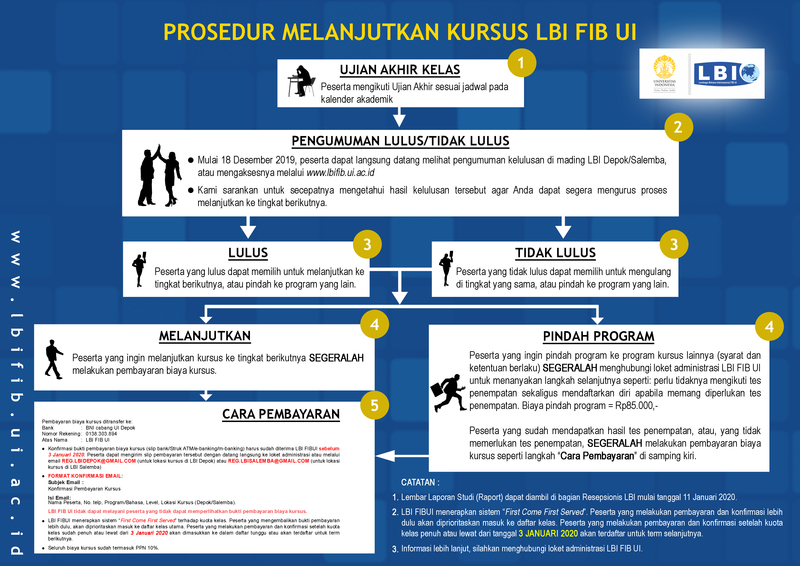 The test is designed for expatriates working in any field of business; however, for those working in banking industry, Indonesian Government has required a legitimate Indonesian proficiency certificate. This type of test excludes writing part. Any international high schools will find the test result a valid proof of their students’ Indonesian proficiency. Participants can register anytime, while the time of the test will be informed at least in 5 (five) working days before the test. WHEN CAN I GET THE RESULT? The test result can be obtained in 7 (seven) working days. WHAT WILL THE RESULT SHOW? The overall score ranges from 0 to 100, qualifying your Indonesian proficiency from ‘very limited’ to ‘very good’. Bring one copy of your passport, and fill the registration form at BIPA Office. To be qualified to attend BIPA Program, the applicant must graduate from High School level or equivalent, shown by their Diploma. To study at BIPA Program, the applicant needs a STUDY PERMIT. A letter from Indonesian Embassy in Applicant’s country or from Applicant’s Embassy in Indonesia stating the Applicant’s nationality and willingness to learn at BIPA Program, University of Indonesia. 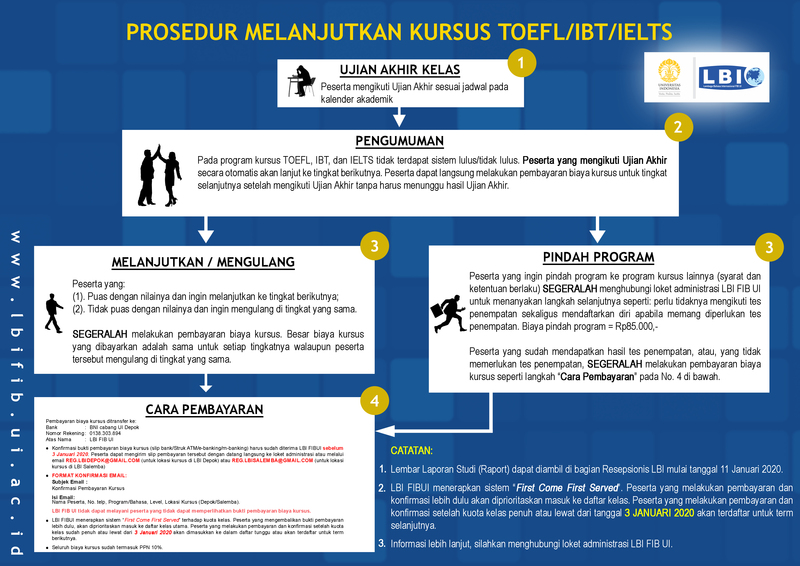 A letter which stated the Applicant’s willingness to obey the Indonesian rules. A letter which stated the Applicant’s willingness to obey the regulation in BIPA Program. BIPA Office will forward the application to the Indonesian Ministry of Education to issued a Study Permit Letter approval. BIPA Office can cancel the application if the Applicant fails to get study permit letter from the Indonesian Ministry of Education.